When we think of improving brainpower, focused techniques and exercises might come to mind. But a new study suggests that something as random and fun as juggling can improve brainpower. Just how exactly does this work and how often do you need to juggle? According to researchers, it comes down to white matter in the brain. When you learn to juggle, your brain undergoes changes in the white matter. Essentially, there is a level of connectivity in areas of the brain that play a role in creating the movements needed to catch all the balls. White matter is a part of the brain where you have clusters of lengthy nerve fibres. These fibres pass on electrical signals from one nerve cell to another, connecting many parts of your brain. In comparison, grey matter is comprised of nerve cell bodies that play a part in processing and computation. Researchers used functional magnetic resonance imaging of the brain to see if they could detect changes in the area of white matter. They looked at healthy adult participants to see what happened when a new skill – in this case juggling – was learned and performed. Older research had already shown that by learning a new activity, there were changes to grey matter. This study, however, is a recent one to show that white matter changes when a new skill is learned. The skills themselves varied a great deal from one adult participant to another. While all participants could juggle three of the balls for a minimum of two cascades, some participants were even able to juggle five balls and perform tricks. Each person showed a change in white matter, leading researchers to conclude that the level of the skill was not that important overall. Rather, the time spent learning it was the crucial aspect that caused changes in white matter. The next step is to get more specific, primarily because the scan used is still too general. Researchers want to know the exact changes in the nerve fibres, whether they change in shape or in number – or perhaps even experience growth of the myelin sheath around the fibres. Although this particular experiment involved juggling, it’s thought that the results relate to learning virtually any new skill. The one thing to take away from the study is that you can try out new things, find something you enjoy and dedicate time to learning. This way, you benefit from the changes in white matter. Many people still seem to think that the brain is unchanging, especially once they have reached their adult years. But in fact, this is far from the reality. The brain is really primed for change and your brain’s connectivity can, in a sense, be rewired to work more efficiently. 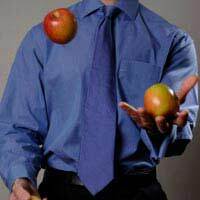 At the very least, juggling is one of many fun activities, but if research continues to prove correct, you can also benefit from improved brainpower.